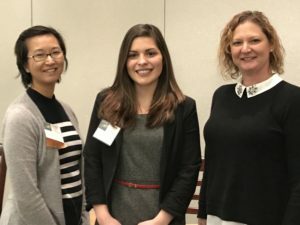 2017 Showalter Innovation Award Winner Jessica Cardenas (center) of the National Electrical Contractors Association with two of our Innovation Award judges, Kathleen Gamble (l) of the American Trucking Associations, and Kelly Kennai (r) of the YMCA of the USA. Not pictured is judge Jeana Hultquist of American AgCredit. Congratulations to the 2017 Showalter Innovation Award Winner, the National Electrical Contractors Association (NECA), for their Chairman’s Challenge program! What did our judges have to say about the NECA program? Click here to read more about their nomination.